One of the most popular names in trade rumors this summer is finally on the move, as the Phillies announced that they have traded Michael Young to the Dodgers in exchange for minor-league pitcher Rob Rasmussen. Philadelphia will also pay the Dodgers about $1.7MM – the amount the Phillies were still due to receive from the Rangers as part of their original trade for Young in December. Young reportedly waived his no-trade clause to make the deal a reality. A widely discussed trade target this summer, Young's name appeared regularly on MLBTR throughout July, but the Phillies opted to hold on to him as the deadline passed. The infielder reportedly sought to return to the Rangers, though we heard that the Red Sox were his second choice. Young was also connected with clubs such as the Yankees and the Orioles. Though Young has spent the majority of his time in the field this year at third base, the Dodgers' incumbent third baseman, Juan Uribe, would appear to offer similar production to Young's .272/.333/.389 line in 2013. However, Young has long experience at every infield position excepting first base, so the Dodgers may opt to use him in a utility role. Rasmussen, 24, was drafted in the second round by the Marlins in 2010. An undersized lefty with a tendency for wildness, he was promoted to Triple-A earlier in the season but was rocked to a 6.46 ERA in 54 1/3 innings, posting a 6.1 K/9 and 5.3 BB/9. However, he's been much better in his 81 1/3 innings this year at Double-A, where he owns a 2.55 ERA. Rasmussen was ranked as the 19th best prospect in the Astros system by Baseball America after the 2012 season before being traded to the Dodgers last December. Ken Rosenthal of FOX Sports first reported the deal on Twitter and was the first to report that Young waived his no-trade clause (Twitter link). Bill Shaikin of the Los Angeles Times was the first to report that the Phillies received Rasmussen in the deal (Twitter link). ESPNLosAngeles' Mark Saxon first reported the amount of cash the Dodgers received (Twitter link). The Mets have signed Cory Wade to a minor league deal, according to Adam Rubin of ESPNNewYork.com. The news was first reported by Chris Cotillo of MLBDailyDish.com (via Twitter). Wade signed a minor league deal with the Rays back in May after being cut loose by the Cubs' Triple-A affiliate. The 30-year-old enjoyed a drastic turnaround in the Rays organization, pitching to a brilliant 2.17 ERA with 6.0 K/9 and 2.5 BB/9 in 49 1/3 innings of relief for the Durham Bulls. His Major League career has been up and down, as he's twice pitched a full season with a sub-3.00 ERA (in 2008 with the Dodgers and 2011 with the Yankees) and twice posted an ERA north of 5.50 in significant action (2009 with the Dodgers and 2012 with the Yankees). In total, Wade has a career 3.65 ERA with 6.9 K/9, 2.1 BB/9 and a 39.5 percent ground-ball rate in 177 2/3 innings between the Bronx and L.A.
Wade is represented by Casey Close of Excel Sports Management, as shown in the MLBTR Agency Database. We'll keep track of tonight's outright assignments here.. The Brewers announced that they have outrighted Mark Rogers off of their 40-man roster, setting him up for minor league free agency. The former No. 5 overall pick has had injury trouble for some time and hasn't been able to put it all together. Adam McCalvy of MLB.com (Twitter link) says that Rogers has been healthy as of late and even hit 93 mph in his last start for the club's high-A affiliate, but wasn't being considered for a September call-up. However, assistant GM Gord Ash says the door isn't completely closed to a return (link). Rogers was ranked as a top 100 prospect by Baseball America in 2005 and 2006. 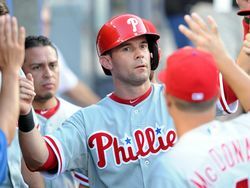 The Red Sox have acquired infielder John McDonald from the Phillies in exchange for minor league pitcher Nefi Ogando, Brian MacPherson of the Providence Journal tweets. Pete Abraham of The Boston Globe adds that the Phillies are sending cash along in the deal (Twitter link). The Red Sox become the fourth team this year for McDonald, who has also seen time with the Pirates and the Indians. The 38-year-old has appeared at second base, shortstop and third base in 2013, but has managed just a .098/.179/.164 batting line in 68 plate appearances. A 15-year veteran, McDonald is a career .235/.274/.327 hitter. Ogando, 24, has thrown 55 innings for the Red Sox's high-A affiliate this season, posting a 4.09 ERA with a 7.2 K/9 and a 4.4 BB/9. He wasn't ranked among Boston's top 10 prospects by Baseball America after the 2012 season. La Velle E. Neal III of the Star Tribune weighs in on the trade, noting that the deal appears like a sell low moment for Minnesota since the player to be named later likely won't be a top notch talent. Morneau's ten-and-five rights are set to kick in next season and one person close to the deal told Neal that might have played a role in the deal since it would have been tougher to deal him if he played out the season and wound up re-signing. Newly acquired outfielder Alex Presley will get plenty of opportunities to lead off and play center field for the Twins this September, manager Ron Gardenhire tells Rhett Bollinger of MLB.com (Twitter link). In a video tweeted by Mike Berardino of the St. Paul Pioneer Press, GM Terry Ryan calls Presley a "catalyst-type guy." In another video clip tweeted by Berardino, Ryan says the trade "might be a good move" for Justin Morneau, noting that the Pirates are likely to make the playoffs. Ryan adds that neither the Twins nor Morneau made an attempt at putting together a last-minute extension before the trade, according to Berardino in another tweet. Pirates GM Neal Huntington said that he feels the trade "allows [Pittsburgh] an opportunity to play deep into October," according to the Pirates Twitter feed. SATURDAY, 3:48pm: The Nationals have informed Espinosa that he will not receive a September call-up, reports the Washington Post's Adam Kilgore. Assuming that holds true, Kilgore notes, Espinosa will likely not be arbitration-eligible next season. Instead, he will earn league minimum and cede an additional year of team control. Espinosa had 2.033 years of service time coming into the season, and appears to have logged 79 days this year before he was optioned on June 19th. If he accrues no more service time, then, Espinosa will obviously fall short of three years of service. Neither will he have enough service for Super Two status, and would not qualify anyway because he did not stay on the active roster for the requisite 86 days this season. While a late-season renaissance would have been even better, these service considerations certainly increase Espinosa's trade value. An acquiring team would have ample, low-cost flexibility to allow Espinosa — who still has options – to try and regain his form. And that team would receive additional upside if Espinosa regains his once-promising career arc. Those same factors, of course, increase his value to the Nats as well. Indeed, Kilgore notes that the organization still has not lowered its asking price on Espinosa and seems disinclined to sell him at a discount. WEDNESDAY, 12:10pm: The Nationals are in the process of deciding whether or not they will include struggling infielder Danny Espinosa in this year's crop of September call-ups, and MLB.com's Bill Ladson reports that the team is looking to trade the 26-year-old. Ladson's source said he doesn't anticipate that Espinosa will play a Major League game this season and the Nationals' efforts to trade him have been stifled by the switch-hitter's poor performance since being demoted to Triple-A Syracuse. Espinosa played through a fractured wrist for a month this season and batted just .158/.193/.272 in 167 plate appearances. Since his demotion, he's hitting just .208/.271/.283 in 292 plate appearances. "Every park that I go into will ask me about Danny. They want to know what he is doing. So the guy has real value." Interested teams undoubtedly look at Espinosa's 20-homer power and 20-steal speed as well as his plus defense at second base and shortstop. However, those positives also come with the injury concerns and a long-standing problem with strikeouts; Espinosa has whiffed in 27.1 percent of his career plate appearances and has a whopping 96 strikeouts at Syracuse this season after leading the NL with 189 punchouts in 2012. Espinosa hit .242/.319/.408 with 38 homers and 37 steals as a regular for the Nats from 2011-12, so trading him at this point would unquestionably be selling with his value at an all-time low. However, this is the second time there have been reports regarding a potential trade of Espinosa, as rival evaluators speculated back in June that playing him at shortstop at Triple-A was an attempt to showcase him as a trade chip. Espinosa has played 32 games at shortstop and 39 at second base since his demotion. With the post-season eligibility deadline at midnight tonight, the August revocable waiver trade market is coming to a close. We just saw a big trade go down with Justin Morneau heading to Pittsburgh, and could still see more action over the afternoon and evening. One situation to keep an eye on is the possibility of the Red Sox going after a reliever, although the Boston Globe's Pete Abraham tweets that nothing is in the works for Boston at the moment. The Orioles ultimately found Michael Morse to be "a little better fit" than Josh Willingham, GM Dan Duquette told reporters including MASNsports.com's Roch Kubatko, leading the team to pull the trigger on his acquisition. "Morse has a big, physical presence and has some power, and hopefully he can bounce back and have a good month," said Duquette. "He has experience and he's been to the playoffs. Those are all good things." Morse's former manager with the Nationals, Davey Johnson, noted that he "shudder[s] to think" about the impact Morse could have hitting in Camden Yards, reports Adam Kilgore of the Washington Post. "That ballpark is made for him," said Johnson. "He's that right-center hitter, and that's the jet stream. He's a good fit there." The Cardinals and Brewers were talking all week about a deal and swapping names before settling on the trade that sent reliever John Axford to St. Louis, reports Jenifer Langosch of MLB.com. Manager Mike Matheny explained: "There's a lot of experience there, a lot of upside. It's hard to forget that two years ago this guy was one of the top relievers in the game." Don't look for any more players to depart Milwaukee via trade, according to a tweet from Tom Haudricourt of the Milwaukee Journal Sentinel. GM Doug Melvin says that the team is likely to stand pat after nabbing a player to be named later and clearing some cash in the Axford deal. After picking up struggling outfielder Jason Kubel, the Indians now face the question of how to use him. As Paul Hoynes of the Cleveland Plain Dealer reports, manager Terry Francona praised GM Chris Antonetti for "trying to help us," but did not seem clear about how Kubel would be deployed. Francona says he first needs "to see how healthy [Kubel] is for the outfield," but did indicate that the 31-year-old could see some time at DH, sharing duties with fellow lefty Jason Giambi. "We love having G [Giambi] do what he does, but he can't do it every day," Francona explained. "It will be nice to have another bat here. If he gets hot, or gets a couple of big hits, it certainly isn't going to hurt anything." Of course, as low-average, low-speed, power-first, defensively-limited left-handed hitters, Kubel and GIambi seem somewhat redundant at this point if one of them does not regularly play in the field. First baseman David Cooper has opted out of his contract with the Indians, the team announced on Twitter. The lefty signed a minor league deal with the Tribe earlier this month that included a clause permitting him to opt out if he was not added to the big league roster by the end of August. Cooper had shown promise, but saw his career derailed when a serious back injury led to his release by the Blue Jays this spring. Still just 26, Cooper put up a .300/.324/.464 triple slash in 145 plate appearances for the Jays in 2012. Since signing with Cleveland a few weeks ago, Cooper has put up a .192/.250/.192 line in 26 Triple-A plate appearances, although his stint at the Rookie ball level was more successful given his collective .314/.364/.373 line over 55 total plate appearances in the Cleveland system. Former Mariners and Reds outfielder Wladimir Balentien has turned into a star in Japan, where he is currently sitting three long balls back of the single-season record of 55 first reached by the legendary Sadaharu Oh back in 1964. With a slugging percentage north of .800, the 29-year-old might have drawn big league interest. Balentien, however, is in the first year of a three-year, $7.5MM deal with the Tokyo Yakult Swallows that does not contain an opt-out clause, according to a recent report from Ben Nicholson-Smith of Sportsnet.ca. High-priced Mets reliever Frank Francisco is moving through the minor leagues on a rehab assignment, but may nevertheless be released upon his activation, according to Adam Rubin of ESPNNewYork.com. Rather than attempting to salvage some value from Francisco's cringe-worthy two-year, $12MM contract, the Mets — who obviously will not secure a post-season berth regardless — seem determined not to allow Francisco to put on a free agency showcase in a Mets uniform. Addressing a reader question, MLB.com's Scott Merkin took a look at the futures of shortstop Alexei Ramirez and outfielder Alejandro De Aza with the club. Merkin says that Ramirez — whose contract includes $19.5MM for the next two years and a $10MM ($1MM buyout) club option for 2016 — would bring a "solid return" in a trade but figures to stick in Chicago. With his home run tallies dwindling to a trickle, Ramirez's deal does not seem to be any kind of bargain, though perhaps positional scarcity around the league increases its value. As for De Aza, Merkin argues that poor baserunning and defense make him more likely to find himself out of the team's plans, especially as he is set to earn a raise on his $2.075MM salary as he enters his second year of arbitration eligibility. While De Aza looks at first glance to be a solid regular at low cost, there seems to be an interesting split on the value of his contribution this year. Fangraphs credits De Aza with 2.2 WAR on the season, while Baseball-Reference pegs him at just .1 WAR based on an exceedingly poor defensive rating. In 2011 and 2012, both sites viewed him as an approximately 2.5 win player. Whatever his actual value, the Sox would presumably be able to get a reasonable return if they made De Aza available via trade. The Angels are working towards a long-term deal with the city of Anaheim, reports Bill Shaikin of the Los Angeles Times. The current proposal would allow the team to drop the appendage "of Anaheim" from its name, and and would see the Angels pay to renovate Angels Stadium in exchange for beneficial land lease and development rights surrounding the ballpark. While a source says that the Sox are still "kicking stuff around" regarding a possible trade today, WEEI.com's Rob Bradford reports that nothing appears imminent. Bradford notes that Boston has been quiet in part because it has failed to see desirable players reach its spot on the waiver wire during August. The club is most likely looking to add bullpen depth at this point, Bradford notes, and is seemingly no longer interested in the Phillies' Michael Young, who has cleared waivers. The Sox need to do everything possible to add a bullpen piece, argues John Tomase of the Boston Globe. Noting that GM Ben Cherington's track record with relievef pitching acquisitions has been spotty, Tomase argues that the team should find an alternative set-up option to the inconsistent Junichi Tazawa. It should be noted that Tazawa has continued to post the same impressive strikeout-to-walk rate that he did last year: in 2013, he has 9.45 K/9 and 1.35 BB/9. He has seen his ERA inflate to a still-solid 2.70 (in 60 innings pitched) due primarily to a much higher home run rate (1.20 HR/9) than the very low rate (.20 HR/9) he put up last year. Cherington discussed a few topics in a short interview yesterday with Gordon Edes of ESPNBoston.com (video link). He noted, in particular, that he believes this club has been constructed with sufficient depth and professionalism to avoid another historic collapse over the stretch run. One of the key players in this season's so-far successful run is outfielder Shane Victorino, whose solid bat and spectacular defense has been worth at least five wins above replacement according to both Fangraphs and Baseball-Reference. As WEEI.com's Alex Speier writes, the three-year, $39MM deal that brought Victorino to Boston — which was viewed by some as an overpay at the time — has been an unquestionable bargain. In another piece, Speier looks at recent Red Sox acquisition Jake Peavy and the two key trades that have shaped his career. Looking back at the 2009 trade that sent him to the White Sox, Peavy said that he knew "the Padres had to move me" and was prepared to consider Chicago since he had previously vetoed another deal that would have sent him there.